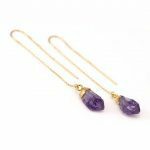 Here is our list of must have Mother’s Day gifts. Being a mom is great, but a mom isn’t all she is. Celebrate Mother’s Day this year with these fun gifts that are about who she is, not about her role as a mother. Pair them with a mother related gift to create the perfect balance. This post contains affiliate links. If you make a purchase through one of my links I may earn a commission at no additional cost to you. As busy moms, we often forget to take the time to pamper ourselves. So send her off for a “me” day to get her hair or nails done or even a spa day with a sister or good friend. Ask your friends for recommendations or snag a deal on Groupon. 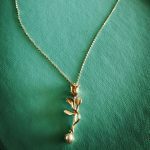 Jewelry can be found on this last and our mom related gifts post. 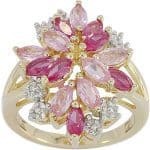 However, while the jewelry there is all about the relationship between mother and child, the jewelry here is purely about making moms feel pretty. Get her a lovely piece of jewelry or something fun based on things she loves! Check out these ideas below or find some of your own. 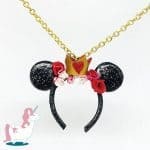 My personal favorite is the Disney ears necklace. I just snagged one for myself and they come in all different characters. Grab her tickets to an experience she will love. Whether it’s her favorite band, a sports game, or a play. Get her a couple tickets so she can go out and have some fun, sans kids. Bath bombs – I’m not a big bath person myself. However, my cousin is a bath bomb aficionado and tells me Lush bath bombs are the very best! Looking for an original idea? Is she enjoys coloring or art and cooking or baking how about one of these cool coloring aprons? This is definitely a gift she’s unlikely to find and get for herself. Subscription boxes are gaining popularity and you can now find a box for all kind of interests. It’s the gift that keeps on giving as they will get it month after month. (You can generally gift a certain number of months so you aren’t on the hook indefinitely) Below are some great ideas. If none of those fit try googling subscription box and something she’s interested in. Just try to check reviews so you’re getting something good! Wine subscription box – I’m not much for wine myself but I scoured the reports on best wine subscription clubs and Winc seems to be high on all the lists. Get $20 off your first order. If all else fails a nice date night is always a nice gift. Just make sure you take care of the planning. Pick a date, a place she likes, and set up a sitter for the kids. It’s her gift so she shouldn’t have to do a bunch of work to make it happen. Take her someplace nice or maybe a place that is special for the two of you. Have a night where you celebrate and remember back when you were dating and have some good kid free fun. I hope you were able to find a great gift idea from our list of must have Mother’s Day gifts. Still need ideas? Feel free to drop a little about the woman you’re buying for in the comments and we’ll see what other ideas we can come up with. Bookmark this list for later and be sure to check out the companion list, Super Gifts for Super Moms that has all mom related gift ideas.